"Excuse me, would you happen to know where the nearest place is that I can buy a julienne peeler?" To which I responded "Well, that's funny, because I am actually on my way to buy a julienne peeler." Me: "A few blocks away in the Chelsea Market there is a store called Bowery Kitchen. They sell everything, I am almost certain they will have a julienne peeler." Guy on street: "Thanks! 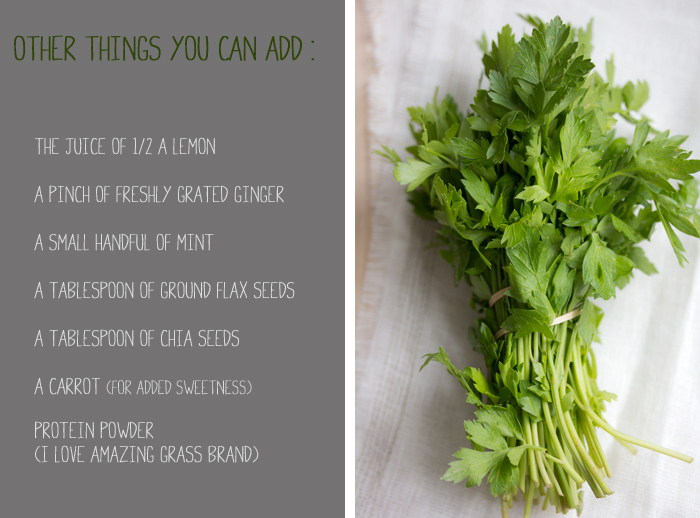 I am trying to eat healthier, so I thought it would be great for me to buy one so that I can eat more raw veggies." Right on guy. Right on. The story does not stop there. So, I continue on my way, run a few quick errands, and head over to buy my julienne peeler .... and there's the guy. Scouring the peeler section. I went over to him and said "Looks like you found it!" Guy: "Hey! Yeah! I did, but I don't know which one to buy." Well, then, of course I went on a bit of a tangent about different peelers, what purpose they each serve, as well as different things you can make with raw vegetables. Raw veggie pasta, raw veggie salad, raw veggie noodle pad thai. In fact, that's what's been on my mind. 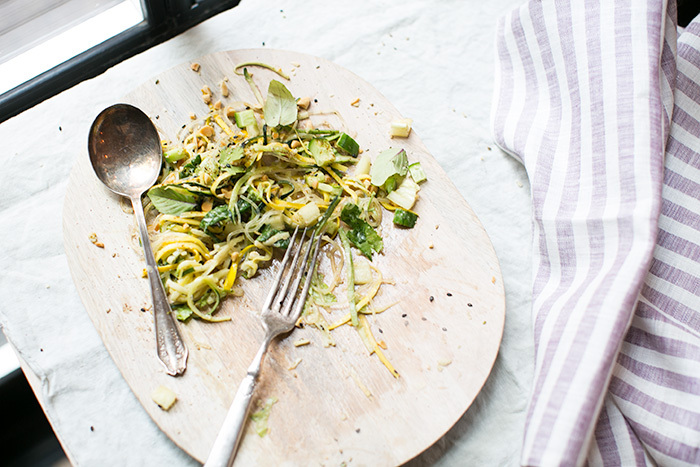 Raw pad thai. That's was why I was buying a julienne peeler. 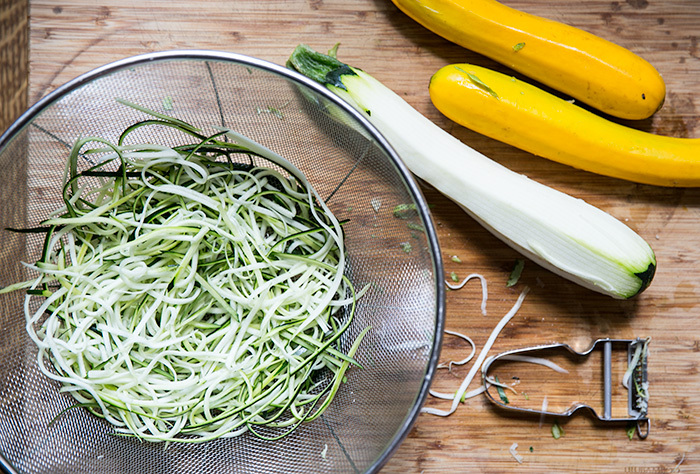 Last summer I bought this crazy, clunky Japanese spiralizer that I would make noodles with. The problem was, I hated using that thing. It was not very user friendly and it was taking up a lot of precious cabinet space. There's been a lot of talk recently about a julienne peelers, so I thought maybe that would a better solution than my cumbersome spirilizer. WELL. I am telling you. This $5 piece of kitchen equipment will CHANGE YOUR LIFE. Seriously people. Life changing. Being able to eat more raw veggies in the summertime, being able to eat my favorite pasta dishes subbing veggies for the bad carbs .... amazing. Yes. Run out and buy one right now. Hold on, I am sure that many of you probably already have a julienne peeler, and many of you have probably already told all of your family, friends, and the checkout person at the grocery store how amazing it is. So, those of you can realte to my level of enthusiasm. The first thing I made with my julienne peeler was this creamy pesto zucchini dish. Seriously delicious. The second thing I made was this raw pad thai. I have been dying to make raw pad thai ever since we moved away from my favorite raw foods restaurant, and I am no longer able to order it on the regular. So now that I have my handy fancy julienne peeler I will be making my own. On the regular. So the story ends with me the and the guy each buying our own julienne peelers ... and we go off on our merry ways to live happy, raw veggie filled lives. And, I hope (if you don't already have one) you will go out and do the same. I went to the market that day because A - I needed some produce, and B - I needed some inspiration. A trip to the market is always the best for that. I walked around aimlessly for about 30 minutes before I decided what I was going to make for Michael and his sister that night. 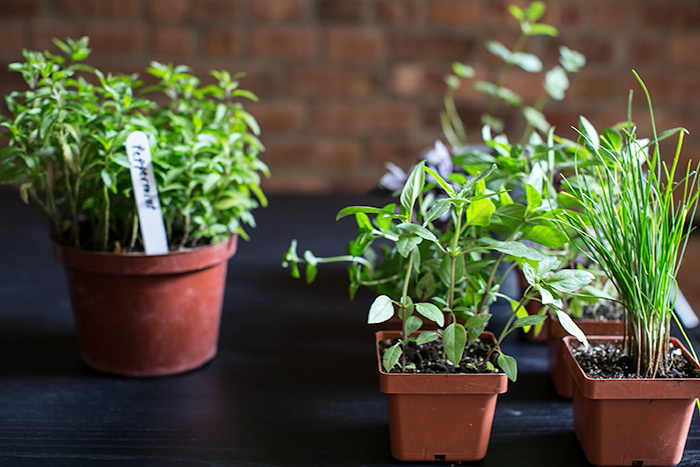 When I was walking around, I stumbled across the most amazing assortment of herb plants. 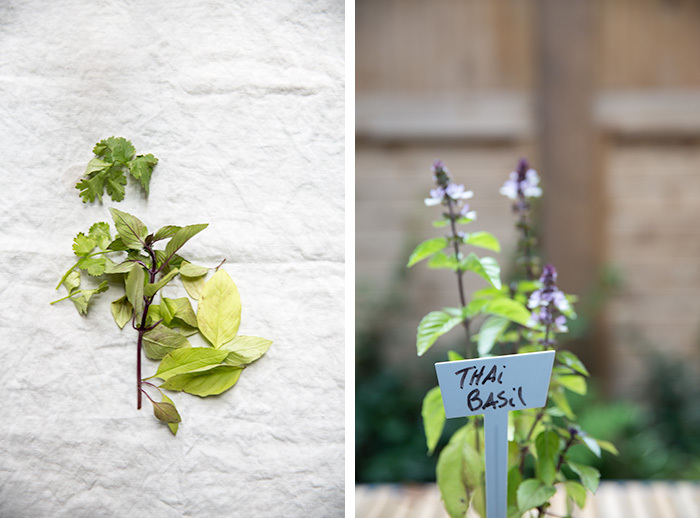 Every kind of basil you could think of and then some ... purple basil, thai basil, spicy basil ... you name it. And mint. So many kinds of mint. I could not resist buys several kind ... of everything. And now our backyard is adorned with some unique varietals of herbs, and I love it. With the purchase of those new herbs and those gorgeous heirloom tomatoes, it was only natural that I would be making some sort of salad. But I wanted something a little more than a salad. Panzanella. I wanted to make a panzanella. 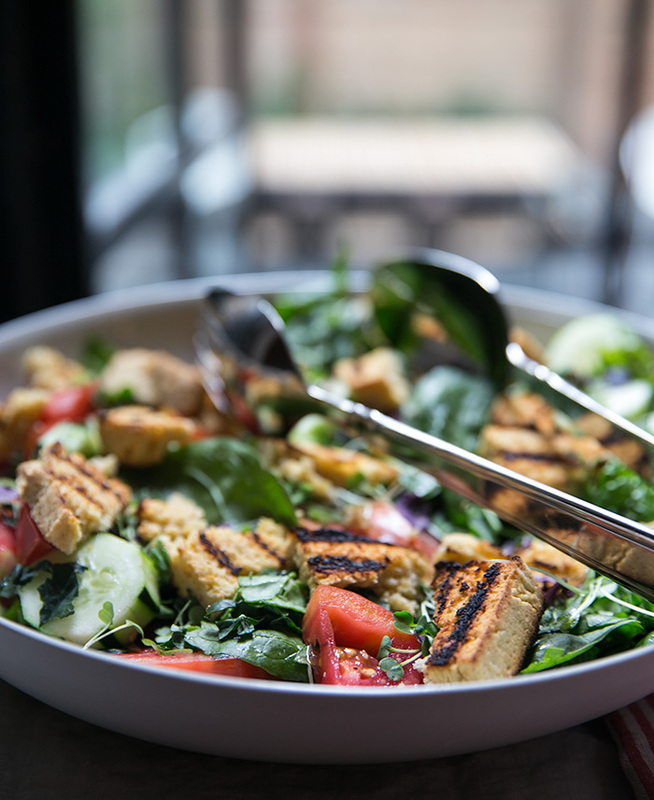 Last summer, panzanella salads were my go-to beach picnic food. I would throw some stale bread together with whatever leftover vegetables we had in the fridge and dress it with nothing more than some really good olive oil, some really good vinegar, and minced garlic. By the time we had made it to the beach and laid our picnic blanket down, the bread had sopped up just the right amount of oil + vinegar + garlic. So darn good. I've been trying to stay away from white bread recently, so homemade gulten-free cornbread seemed like the perfect, if not better, substitute to throw into this panzanella. Grilling the cornbread makes it a bit crispy on the outside, mimicking that stale bread texture. It's pretty awesome. You can make a panzanella with just about any kind of vegetable you have in your fridge. 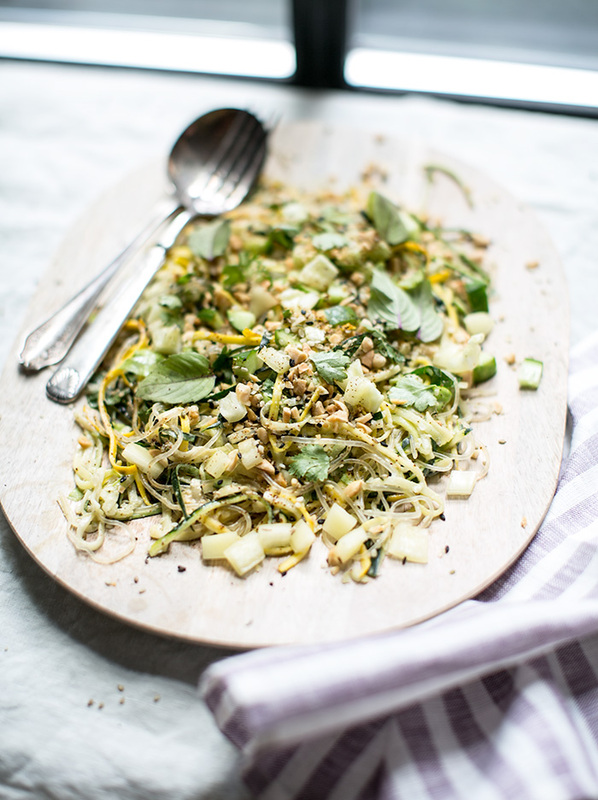 Later in the season, the summer vegetables like corn and zucchini would go so well in this salad. I'll let you in on a little cornbread secret. Bob's Red Mill makes a really great gluten-free cornbread mix ... so if you want to make this in a flash, you can use that instead of making it completely from scratch. I am always one to say that from scratch is best, but if you want to take a shortcut for this ... I won't judge. 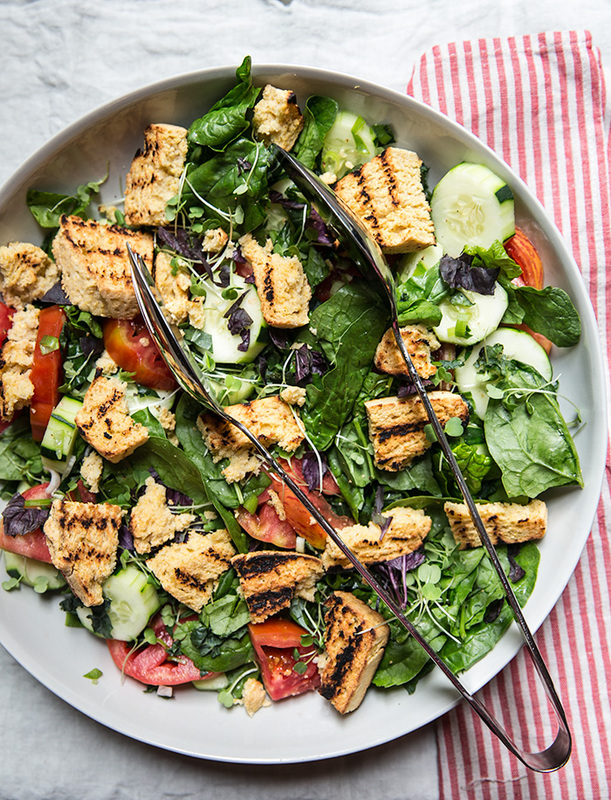 I'd just be so happy that you made this grilled cornbread panzanella. Recently, I've been getting asked [a lot] what it is that I have for breakfast. My answer is: on most days, a green smoothie. Then, the question that usually follows is: aren't you hungry shortly after? To which I answer: Nope. Not with the amount of veggies and greens I'm consuming. 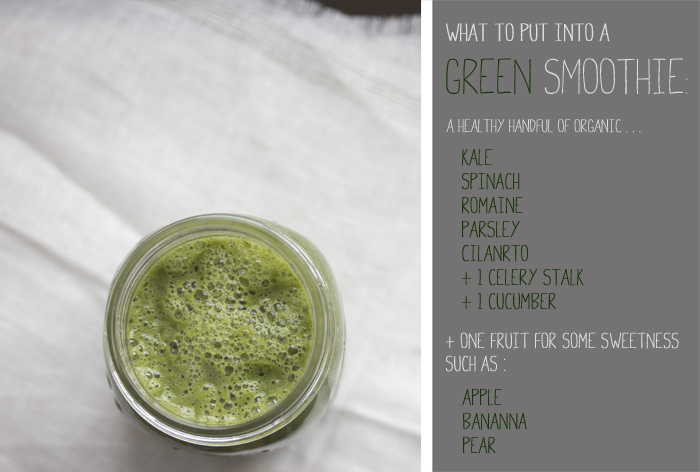 Because of this, I decided to post the recipe [well, actually it's more of a guideline] for how I make my green smoothie. I have to warn you though, there is no exact science to this, and some days it tastes amazing and some days it's ... well .... to be frank, not so amazing. It all depends on the freshness and/or the ripeness of certain ingredients. But the one thing remains the same is that I love the way I feel when I drink a green smoothie in the morning. Smoothies are different than juices. There are definitely stronger arguments that smoothies are better simply because the vegetables are being consumed whole, the way they were meant to be. I also find that for a meal in the morning, the green smoothie is much more filling and will hold you over better than a green juice. So what are the benefits when you drink green smoothies most mornings? Lots. Besides getting a boat load of vitamins and minerals from the gorgeous variety of greens, you are also getting a hefty dose of our best friend, fiber. Fiber helps us detoxify, and helps keep our insides happy. When our insides are happy our outsides look happy ... simple as that. With that, I bring you some directions for crafting your smoothie. Play around with different ingredents, see what you like and what you don't like, and always switch things up depending on what you find is fresh, local, seasonal, and organic.